If you want to return money to a guest because you had to cancel the booking or the booking was changed, it depends on your payment settings and policy settings, how the refund will be handled. If the booking was paid by credit card and you have activated the automatic refund function in your payment settings, then the money will be automatically refunded without any further action from your side in case a cancellation policy has triggered a refund in the system. 💡 Note: This setting is currently not available for Lodgify Payments, only for Stripe, Braintree, and Authorize.Net. 💡 Note: The scheduled refunds are triggered every 4 hours, so if a user cancels a booking that should trigger a refund automatically, it could take up to 4 hours to see the refund done. Select the booking you want to do the refund in. 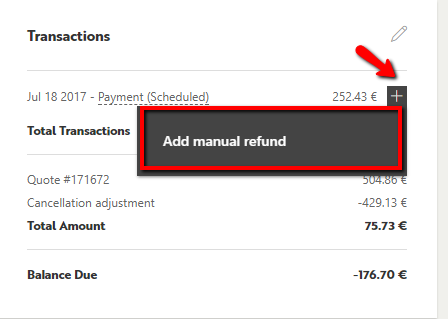 💡 Note: Add Manual Refund only serves to update your transaction record with a refund. A new window slides in where you can insert the amount that you want to refund. Then tick the box to confirm that your payment gateway (Stripe, Braintree, Authorize.Net or Lodgify Payments) will refund the confirmed amount to the guest. A new window opens up to send a message to your guest and notify him of the issued refund. 💡 Note: In this case, refunds in the Lodgify Reservation System are currently only to ensure your Transaction Records are up-to-date and reflect your payments received/refunded correctly. You will still need to make the actual payment to your guest via one of the channels mentioned above. 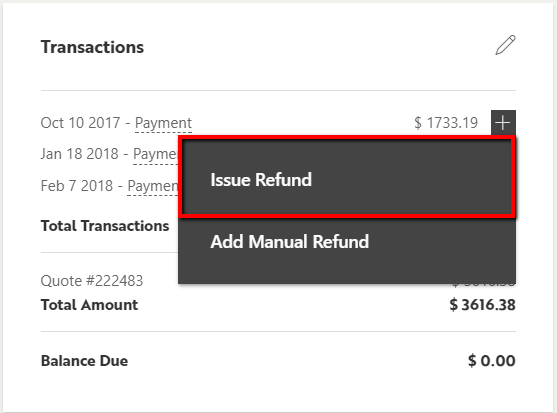 A new window slides in where you can insert the amount that you want to refund. When accepting payments through credit cards, certain fees are charged per transaction depending on the activated payment gateway. When issuing a refund to the guest, these fees will be refunded to you in proportion to the amount. If the transaction fee was 3€ and you return 50% of the prepayments received, you will be refunded 1,50€ of the transaction fee. 💡 Note: If you handle the refund directly from your Stripe account, only the Stripe Fee will be refunded, not the Lodgify Transaction Fee. Lodgify Payments If you refund the partial or total value of a booking within Lodgify we will refund the partial/total fee charged for the received transaction. Braintree If you refund the partial or total value of a booking within Lodgify we will refund the Transaction Fee at the end of the month (or if in the same month, the Transaction Fee won't be invoiced). Braintree will refund the partial/total Braintree Fee charged for the received transaction. Authorize.Net If you refund the partial or total value of a booking within Lodgify we will refund the Transaction Fee at the end of the month (or if in the same month, the Transaction Fee won't be invoiced). Authorize.Net will refund the partial/total Authorize.Net Fee charged for the received transaction.